Col John Jones of Nanteos who was known to have raised the Cardigan Militia in support of King Charles I during the Civil War. He had three daughters - Mary, Anne and Elinor. His daughter Anne succeeded at Nanteos on her father's death in 1666. Anne married Cornelius Le Brun who was born in Cologne Germany. He came over to Wales to work on the lead and silver mines as a mining engineer, and made his wealth. Later he became the High Sheriff of the County in 1674. He died in 1705 and Nanteos was left to his only issue. Avarina Le Brun (1675 - 1728) married William Powell (1658 - 1738) of Llechwedd Dyrus, which was situated across the Paith Valley from Nanteos. William was the son and heir of Sir Thomas Powell K. C. who was Knighted by King James II in 1688 and was one of the Judges on the Kings Bench. William Powell and Avarina lived at Nanteos after the death of Cornelious Le Brun in 1705. They had five children- Thomas, William, John, Anne and Elizabeth. Their father died in 1738, and the estate was passed down to their eldest son Thomas. Thomas Powell (1699 - 1752) began to build the present Nanteos, in 1738 immediately on the death of his father. He married Mary Frederick grand-daughter of Sir John Frederick, Lord Mayor of London in 1662. It was her wealth that built Nanteos, but sadly Thomas died before completion of Nanteos with no issue, (though it is said that there was an illegitimate son). Nanteos was left to his broher William. The Reverend William Powell took over the estate in 1752 on the death of Thomas. He married Elizabeth Owen, eldest daughter of Athelstan Owen of Rhiwsaeson, Montgomeryshire. William was ordained deacon in the diocese of Lincoln in 1731 and was made D.C.L. in 1763. He died in 1780, with issue - a daughter and a son Thomas. Thomas Powell (1745 - 1797) married Eleanor the eldest daughter of Edward Maurice Corbett of Ynysmaengwyn, Merioneth. Thomas became High Sheriff of the County in 1785. They had five children William Edward, Thomas John, Richard Owen, Elinor Elizabeth and Anna Corbetta Hanna Maria. Thomas died of an epilectic fit on a street in London in 1797. The estate was left to the eldest son William Edward, but he was only nine years old, he was too young to run the estate. His mother Eleanor took her young family to live in France, (where later she died). During this time in France Nanteos was let to Samuel Pocock Esq. 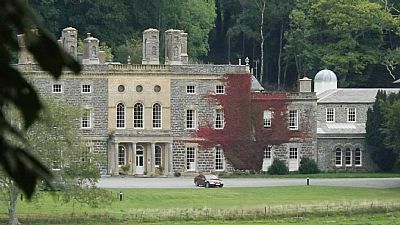 William Edward Powell took over the estate at the age of 21, in 1809. By 1810 he was the High Sheriff of the County and married Laura Phelps, eldest daughter of James Sacksville Tufton Phelps, of Coston House Leics. They had two children William and Cornelius . Sadly Laura died in 1822. He married again in 1841 to Harriet Dell, widow of George Ackers of Moreton Hall, Cheshire. William Edward died aged 66 and the estate was left to the eldest son. William Thomas Rowland Powell (1815 - 1878). He married in 1839 to Rosa Edwyna Cherry eldest daughter of William George Cherry of Buckland Herefordshire. They had two children George and Harriet. Harriet sadly died at the age of 13. William T. R. Powell became a member of Parliament in 1859 and 1865. Later years he was confined to a wheelchair, and died in 1878 and left the estate to his only son George. George Ernest John Powell (1842 - 1882). After the death of his mother in 1860, George who never got on with his father left the family home. He never returned until the death of W. T. R. Powell, eighteen years later. George the most interesting character of the Powell family. Educated in Eton then on to Oxford where he met his for many years Charles Algernon Swinburne the famous poet. George himself also published a few poetry books. His most famous publication is the IcelandicTranslations. In 1878 he returned to Nanteos to run the family estate. During this time he tried to establish a free library at Aberystwyth but unsuccessfully. He married in 1880 Dinah Harries from Goodwick Fishguard, but sadly a year later he died with no issue at the age of forty years. The estate was left to his second cousin. William Beauclerk Powell, (George's fathers 1st cousin, Richard Owen Powell's son). Bequeathed Nanteos in 1882. He married Anna Maria in 1864, 3rd daughter of David Lewis of Bronavon Cardiganshire. They had one issue, Edward born in 1870. They lived at Nanteos until 1911, when William and Anna died within days of each other. Edward Athelstan Lewis Powell (1870 - 1930) married Margaret Lousia Joan Pryse, which united two of the largest estates in Cardiganshire. Gogerddan and Nanteos after centuries of disagreement. But their marriage was scared by tragedy - their only son born in 1899 was killed in action in Buvignes France during the First World War, on the 6th November 1918, just 18 years old. Edward Powell lived on until 1930. In 1930 the Powell male line at Nanteos came to an end. Margaret Lousia Joan Pryse Powell (1862 - 1951) continued to live at Nanteos untilher death in 1951. This was the end of the Powell family at Nanteos. She bequeathed the mansion and the estate to Mrs Elizabeth Mirylees, a distant relation of Edward Powell. Major James Smith Mirylees, and his wife Elizabeth moved into Nanteos with their daughters in 1956 and lived there until they sold Nanteos and the remaining estate of 2000 acres in 1967, after living their for 11 years. Rose and Geoff Bliss bought Nanteos in 1967. Together with their two children Tony and Michael, they open Nanteos to the public as a stately home. Showing people how the Powells lived their 'high' life. Thousands of people came to see Nanteos, from all over the world. After 16 years of running Nanteos as a stately home, the Bliss family decided to sell. Nanteos was sold in 1983. Since 1983 Nanteos has gone through many changes of occupancy. Finally it was converted into a Hotel in 1989, restored in elegant preference to the historical aspect of the mansion. Giving a traditional feel to the guests of a local County House. The current owners purchased Nanteos in 2004, giving Nanteos a fresh lease of life. Nanteos is now owned by a privately owned trust; a family business, who have transformed the mansion into its former glory. The décor in each room reflects the house's Georgian origins and tells stories of Nanteos's past of bygone times and the romance of Nanteos's setting. They have been individually designed, blending original features, state-of-the-art facilities and opulent furnishings. Nanteos Mansion has a long, colourful history, full of fables, culture, mystery and romance.